With the dogs fed and the travellers revived in the sauna we sat down to a meal of meat balls (with veggy ones for Sophie and I). It was a clear night and the temperature outside was already below -20°C. As we ate the conversation turned to the possibility of seeing the Aurora Borealis tonight—clear skies are an important factor in being able to see the northern lights. As we finished our meat balls I felt a strong urge to look out of the north facing window at the back of the cabin. Could that be a faint green glow on the northern horizon? I wasn’t going to risk making a fool of myself by shouting about it, so as Raikka announced cake for dessert I made an excuse to head back to the sauna, where I’d left my watch earlier. Out in the dark my eyes quickly adjusted and it was soon clear that it was indeed a green glow on the northern horizon. 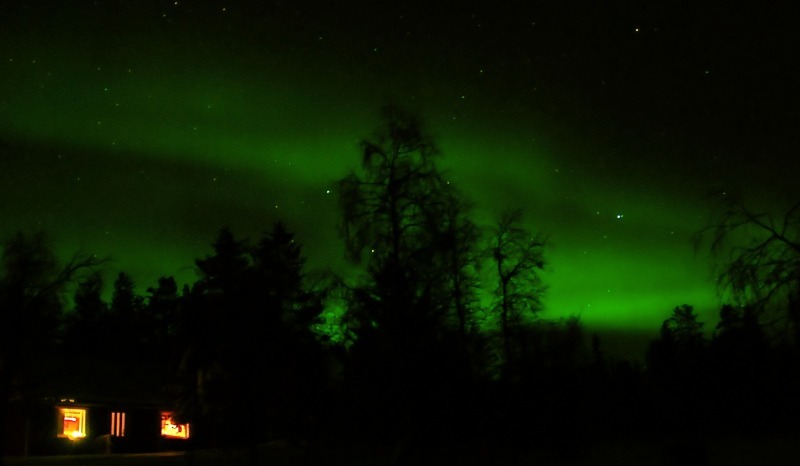 Now I was certain—I rushed back to the cabin and sticking my head through the door announced “If any one fancies skipping cake there’s a bit of a northern lights thing going on out here”. The cake didn’t stand a chance. We pulled our warm gear back on and headed down to the lake, away from the gas and paraffin lights of the cabin. A wide arc of ghostly green light spread above the snow covered trees on the horizon—an ephemeral curtain shifting and shimmering, dancing in the night. Sometime one end would grow brighter, sometimes the other. Sometimes it would seem nearly still, then suddenly waves would pulsate through a part of it, as if someone had left a heavenly window open and the curtain was wafting in a breeze. James managed to get some photographs, although sadly I think he missed the best bits going back inside to fetch his camera and a tripod. The show didn’t last long, which is just as well. It came to an end at about the same time as we were starting to feel like we’d stood still in the freezing air for quite long enough. But the cabin wasn’t far away and with the wood burner roaring it was warm and cosy inside. And the cake was waiting, along with the Jamesons and Sloe Gin.